I have sold a property at 1101 2165 40TH AVE W in Vancouver. Vancouver, BC - January 3, 2014 - The Greater Vancouver housing market maintained a consistent balance between demand and supply throughout 2013. The Real Estate Board of Greater Vancouver (REBGV) reports that total sales of detached, attached and apartment properties in 2013 reached 28,524, a 14 percent increase from the 25,032 sales recorded in 2012, and an 11.9 percent decrease from the 32,390 residential sales in 2011. The number of residential properties listed for sale on the MLS® in Metro Vancouver declined 6.2 percent in 2013 to 54,742 compared to the 58,379 properties listed in 2012. Looking back further, last year’s total represents an 8.1 percent decline compared to the 59,539 residential properties listed for sale in 2011. Last year’s listing count is on par with the 10 year average. The MLS® Home Price Index composite benchmark price for all residential properties in Metro Vancouver is currently $603,400. This represents a 2.1 percent increase compared to December 2012. Residential property sales in Greater Vancouver totalled 1,953 in December 2013, an increase of 71 percent from the 1,142 sales recorded in December 2012 and a 15.9 percent decline compared to November 2013 when 2,321 home sales occurred. December sales were 8.1 percent above the 10-year December sales average of 1,807. New listings for detached, attached and apartment properties in Greater Vancouver totalled 1,856 in December 2013. This represents a 34.5 percent increase compared to the 1,380 units listed in December 2012 and a 42.8 percent decline compared to November 2013 when 3,245 properties were listed. Sales of detached properties in December 2013 reached 762, an increase of 79.3 percent from the 425 detached sales recorded in December 2012, and a 21 percent increase from the 630 units sold in December 2011. The benchmark price for detached properties increased 2.5 percent from December 2012 to $927,000. Sales of apartment properties reached 850 in December 2013, an increase of 68.7 percent compared to the 504 sales in December 2012, and an increase of 9.8 percent compared to the 774 sales in December 2011.The benchmark price of an apartment property increased 1.8 percent from December 2012 to $367,800. Attached property sales in December 2013 totalled 341, an increase of 60.1 percent compared to the 213 sales in December 2012, and a 34.3 percent increase from the 254 attached properties sold in December 2011. 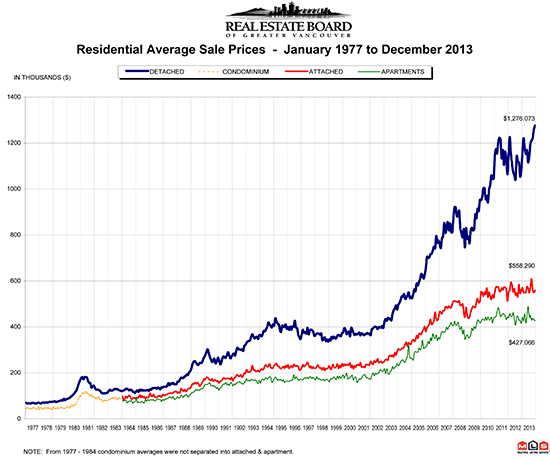 The benchmark price of an attached unit increased 1.2 percent between December 2012 and 2013 to $456,100.